Questions about potential disasters in and around the city and what you and your family can do to be prepared. 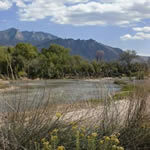 The Rio Grande River runs through the heart of Albuquerque and is lined by a cottonwood bosque; Sandia Mountains are east of the river. What potential disasters is the City most preparing for? First and foremost, we focus on the threat of a major wildfire in the bosque or in the East Mountains. Second, we focus on threats of spills of hazardous materials stored locally and spills of hazardous materials in transit on the two major interstate highways and the Burlington Northern and Santa Fe Railroads. We remain vigilant for acts of terrorism by foreign terrorists or radical, extremist domestic groups. And we prepare for flooding in the Valley areas or major snow emergencies in the Tijeras Canyon area. At a minimum: three gallons of water per person and a three-day supply of non-perishable food per person. Exceeding these minimal recommendations by the Federal Emergency Management Agency (FEMA) is wise and prudent. Remember your manual (non-electric) can opener, as well. See FEMA's valuable online resource tool, Are You Ready? Each citizen should have a personal disaster plan, realizing you may have only a few minutes to evacuate. Question that families must ask of themselves: How will each individual member of your family react when you are not together? Where will you regroup? How will you make contact if cell phones are down? Do you know how to turn off the water and other utilities that go into your home and business? Does your car have gas? If you won't have transportation out of the city, how will you contact officials to communicate your needs? To receive your copy and develop a detailed plan, see FEMA's valuable online resource tool, Are You Ready? Follow instructions from your elected City officials and other local authorities. In addition to acting on instructions you hear from the City via the media, you can check the City website or call 311 to ask questions. If the need arises for shelters, evacuations or both, activate your personal (and family) disaster plan. See our more details on What You Can Do to Be Prepared. How is the City preparing for a disaster? The Office of Emergency Management examines risks to the local area and needs for training, equipment, and other resources. We train and prepare those members who will serve in key positions in the Emergency Operations Center. We plan and conduct emergency training exercises. We oversee all planning, and have submitted to the City Council an All-Hazard Emergency Operations Plan based on federal standards and best practices around the country. We participate in joint planning and training with federal, state, Albuquerque Public Schools, United States Postal Service, Sandia National Labs, Kirtland Air Force Base, and other government entities. What is the City doing to prevent a disaster? We identify risks and hazards in the Metro area and work to mitigate or reduce their potential disastrous effects. We work with Bernalillo County to reduce dangerous chemicals, where possible, and promote alternate routes to reduce hazardous material transit in populated areas. We ensure the Fire Wise programs are reducing fuel sources close to your home. We reduce fuel loads in the Bosque. We look at private and public HazMat generators and work with and participate in many programs with the Albuquerque Local Emergency Planning Committee (LEPC). We enhance tactical planning for terrorism events by improving information sharing between tri-county agencies and higher levels of government. We do all this and more by implementing the City's Pre-Disaster Mitigation Plan, which is currently pending state and Federal Emergency Management Agency (FEMA) approval. The Mayor, the Office of Emergency Management including the Emergency Operations Center, and the Incident Commander will lead and manage the crisis. The City's 311 call center will be notified. As needed, the Bomb Squad, Special Weapons and Tactics Team (SWAT), and other Police Department teams will direct traffic, block streets, and go door-to-door. Emergency Medical Technician (EMT)-trained Fire Officers and Rescue Officers will combat fire, rescue people, and control hazardous materials. As needed, shelters will be established and evacuation routes announced. What role does the 311 call center play in an emergency? 311 is fully integrated into the City's All-Hazards Plan. During a disaster, you can call 311 for information and instructions. Instructions may include shelters and preferred evacuation routes. Only call 911 to report an event immediately threatening life or property or the loss of life or property. Primarily, the Police Department's role is to deal with criminal events. The Police Department's Bomb Squad may need to swing into action, as may their highly trained Special Weapons and Tactics Team (SWAT), or they may engage in traffic control. Police may also assist in coordinating support of fire and rescue efforts as requested by the Fire Department to include; securing a safe area for firefighters to operate, blocking streets, or going door-to-door to notify citizens to move to shelter or to evacuate. Also, the police aviation unit provides visual observation platforms to evaluate disasters in progress. Abq's fire & rescue officers are prepared to respond to any emergency with Emergency Medical Technician (EMT) training. Primarily, the Fire Department will respond to rescues, structural failures, and land wildfires. All fire officers and rescue officers are Emergency Medical Technician (EMT)-trained. The Fire Department maintains two hazardous material response teams at all times, trained to enter and control hazardous material spills. Fire also staffs a heavy technical rescue taskforce. Taskforce officers are trained, equipped, and experienced to rescue from collapsed buildings, confined spaces, trenches, and heavy automobiles. What is the Emergency Operations Center (EOC) and how does it work? See page on the EOC. Who else is involved in emergency management in the state of New Mexico? See the full list of emergency management programs in the state of New Mexico.